frugal Christmas - Frugal Living in the UK Frugal Christmas, thifty shopping, gift and food advice. Waiting until winter to do your Christmas shopping would seem to be sensible, however it could cost you a lot more. Look around the sales and clearouts of old lines throughout the year for gifts – this also takes much of the hassle out of December! If you have very specific items to buy starting your shop early gives you time to compare prices and get the best deal. Argos prices are often hard to beat. You can search for some amazing deals on eBay or check out their Daily Deals. Cheaper ways to shop on Amazon include their Certified Refurbished section and their Outlet for overstocks and marked down items. Everything5Pounds sell unsold stock from top High st. brands, all detagged, and all £5. Some bargains to be had across clothing, footwear and homeware! The first time we browsed this site we kept seeing expensive looking shoes and thinking, ‘Oh those are lovely, I wonder how much? Oh yes, £5!’ They sometimes have a £2.50 sale on too. Homemade sweets and cookies can make lovely presents – gift boxes and petit four cases can be found cheaply in supermarkets throughout the year. Got stockings to fill? The Book People and The Works are fantastic for selling sets of books for the price you would normally pay for one, so great if you have lots of kids to buy for (or adults!). The Works also has great deals on stationery and toys. Ethical Superstore have a large range of fair trade and environmentally friendly gifts. Don’t forget the most frugal option of all! Buy Nothing Christmas – we always agree on a no present thing except for the kids with our closest family and friends. It takes a lot of the work out of Christmas too! You can go down the same route and buy your cards in the January sales or summer clearances or you can make you own. This does not have to be a complicated matter – simple designs are often the most effective. Look around for well priced card, some paint/glue/glitter/sparkly confetti etc. If you have children you may already have much of this in the house already (could the children be persuaded to make the cards?!). A potato or old sponge can be cut into festive shapes for printing – a red Christmas tree shape on green card is very attractive. You could cut snowflakes from plain paper and glue these to a contrasting colour. If you are very organised you could press flower petals in books during the summer and make wreath designs with them for your cards. All these ideas can be used for gift tags also and for decorating plain brown wrapping paper – much cheaper than Christmas wrap. If you have a computer it may have programs installed with printabale card designs for A4 sheets of paper – these can be nice too. Many discount supermarkets sell value envelopes or you may find that you can get away without for cards that you hand deliver. Homemade decorations can be really lovely and cost very little. Traditional things like coloured paper chains are really nice hung up in place of tinsel. Very attractive tree decorations are small match boxes wrapped up like presents with paper glued on to look like ribbons and a thread attatched for hanging. Cookies on ribbons are lovely – if you want to eat them better make them a bit last minute! Use a drinking straw to make a small hole near the top prior to baking for the ribbons. For a very natural look to the tree slice oranges thinly, skins and all, into round slices and dry them out on your oven’s lowest setting for a few hours – then thread them on ribbon or string. Gather pine cones in the woods, dry them near a radiator for a while (days, weeks) – dot them with glue and sprinkle with glitter – garden centres charge a lot for these! They look lovely piled round the bottom of the tree. If you know of a local source of holly or ivy a few sprigs are very effective – layed on shelves, or around candles and cones as a centre piece for the table. Salt dough tree decorations are simple and cheap: recipe is 1 cup plain flour, half a cup salt, half cup water, mix, roll, cut with festive cutters. Bake for 2 hours at 120C/240F. Frankly, unless you are Picasso-esqu in talent, they look more sophisticated unpainted, perhaps just glazed with pva glue. 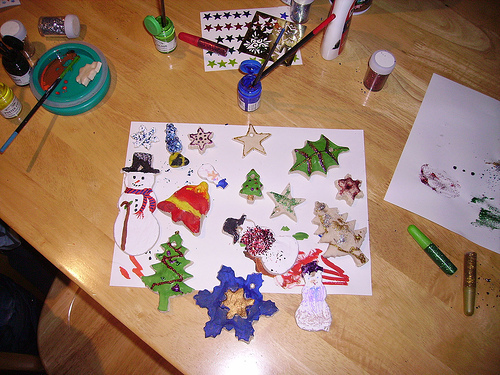 But who can beat going mad with paint and glitter at Christmas? Do make sure to store these in a dry place else you will have salt dough mush next year! Once again if you make it yourself it will cost less. Stocking up on staples and festive treats at clearance specialist Approved Food can also save you a lot of money. Below are some of our favourite homemade holiday dishes. Great article, Christmas is out of control! My family (normally 8 adults and 2 kids) do a secret santa every year, meaning we only have to buy something for the kids and one other present, rather than for each adult! We set a limit of £10 which means you have to put a lot of thought into it! Works really well for us, and saves us loads of money! An amazing energy-saving device, this Halogen Oven would make a great gift. Comes with lots of accessories and is a snip at £25! (Price right at time of writing, Dec '14).